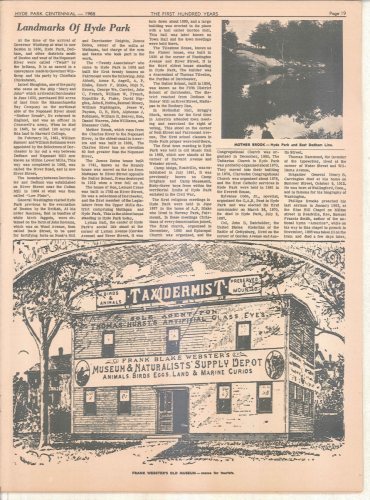 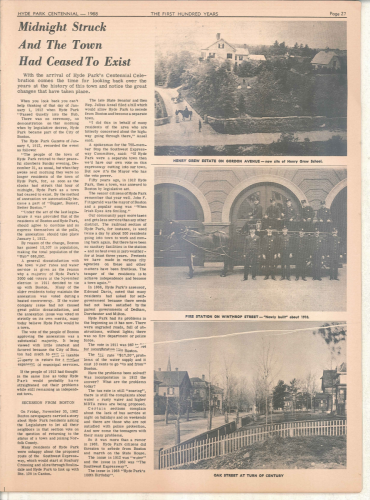 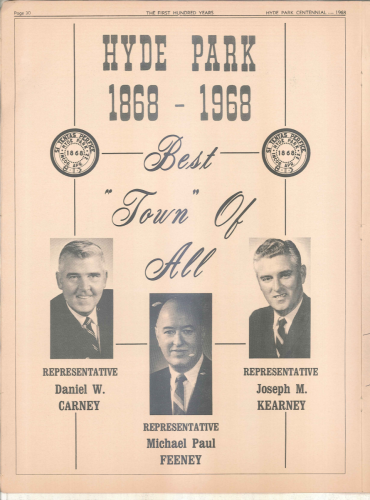 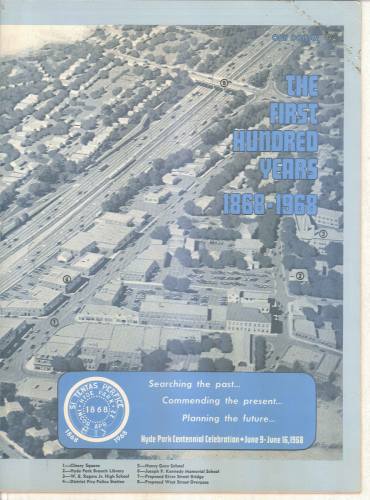 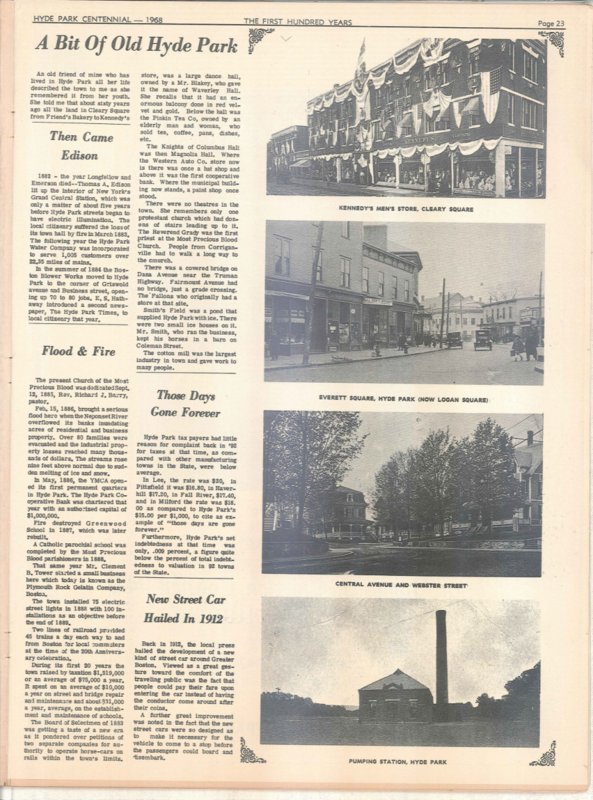 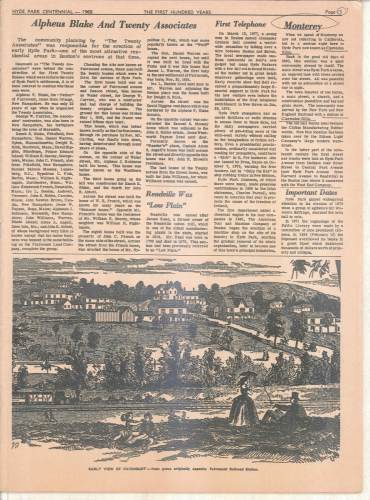 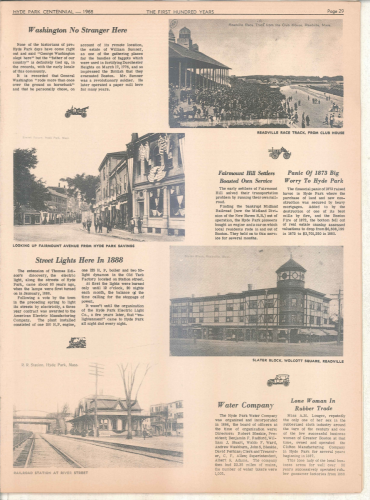 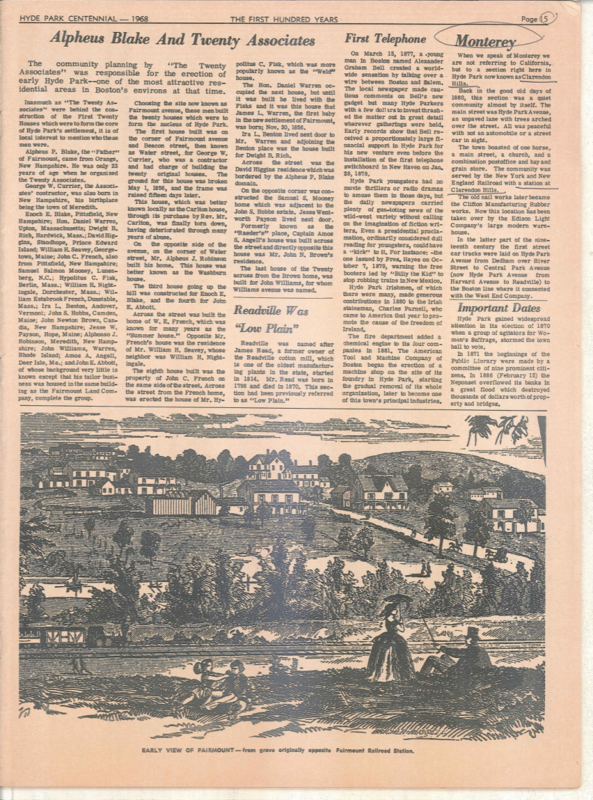 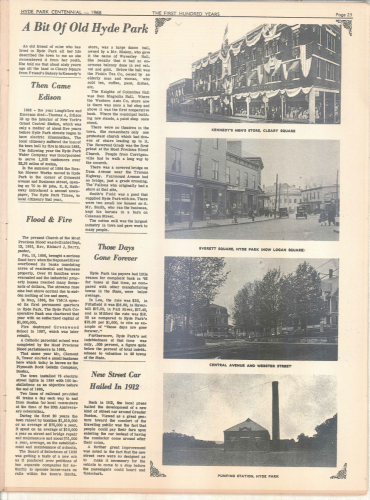 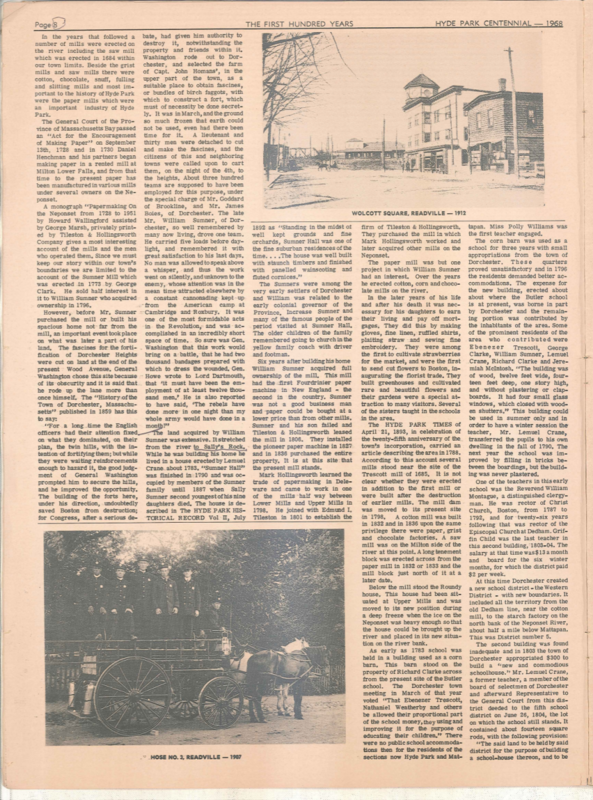 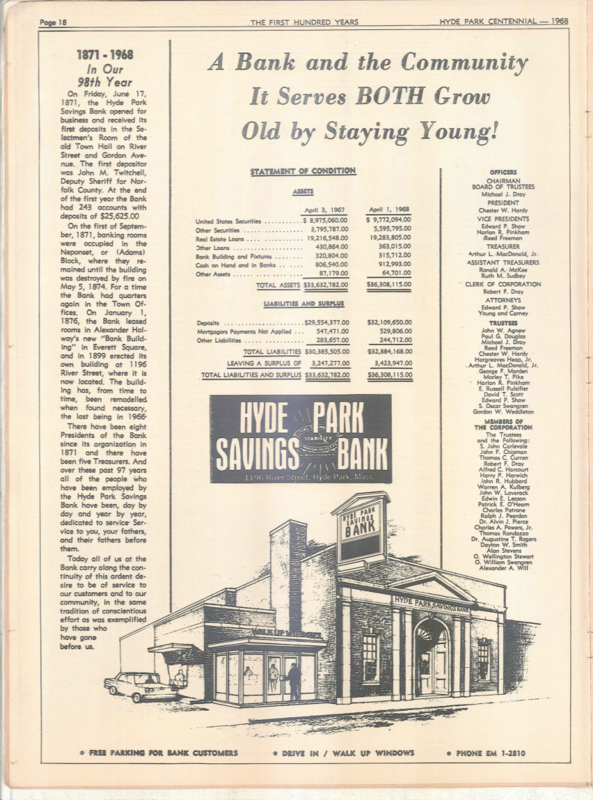 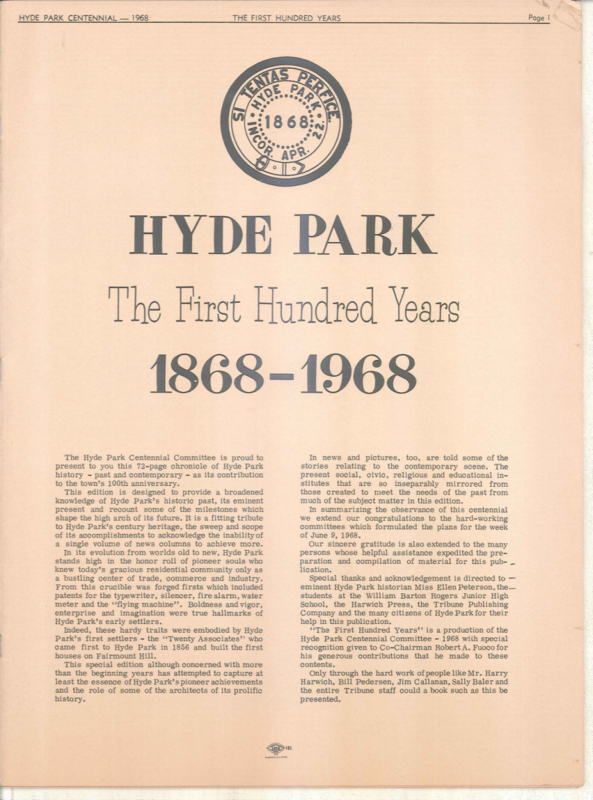 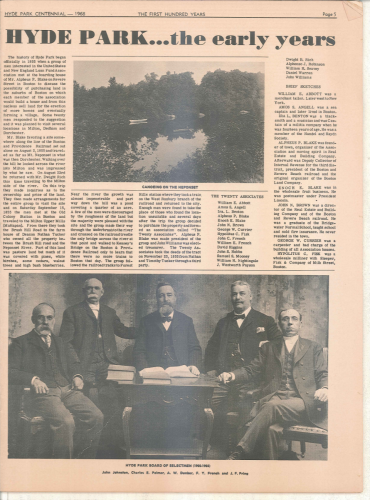 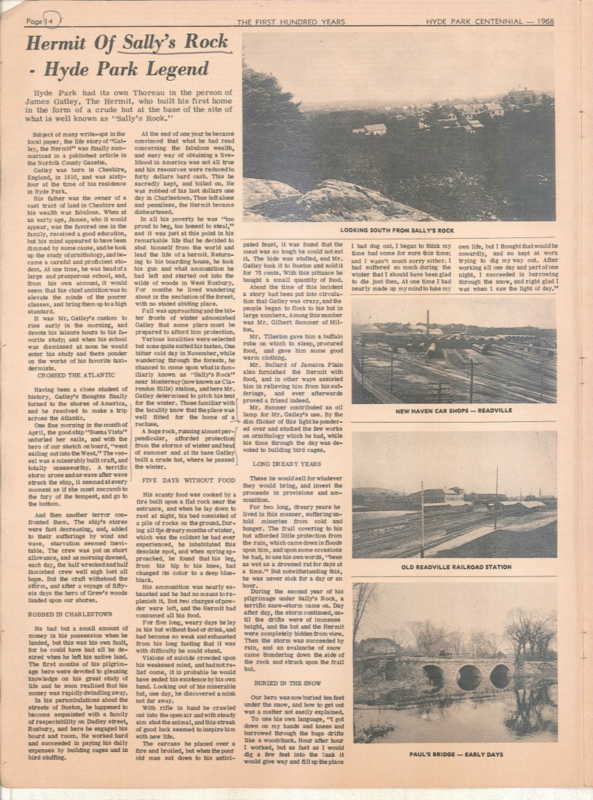 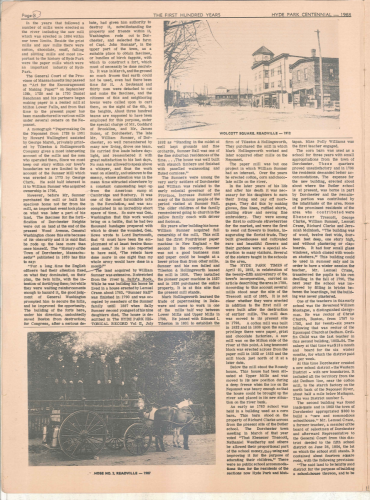 The Hyde Park centennial committee published this large format book of Hyde Park history in 1968 to celebrate the 100th year of the town’s incorporation. 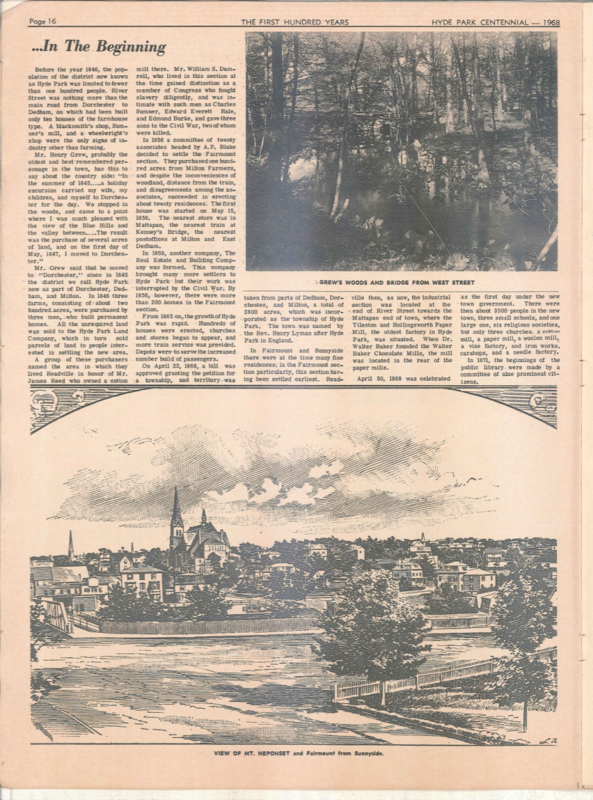 Here is the full text from that publication’s introduction, and below that, the collection of images. 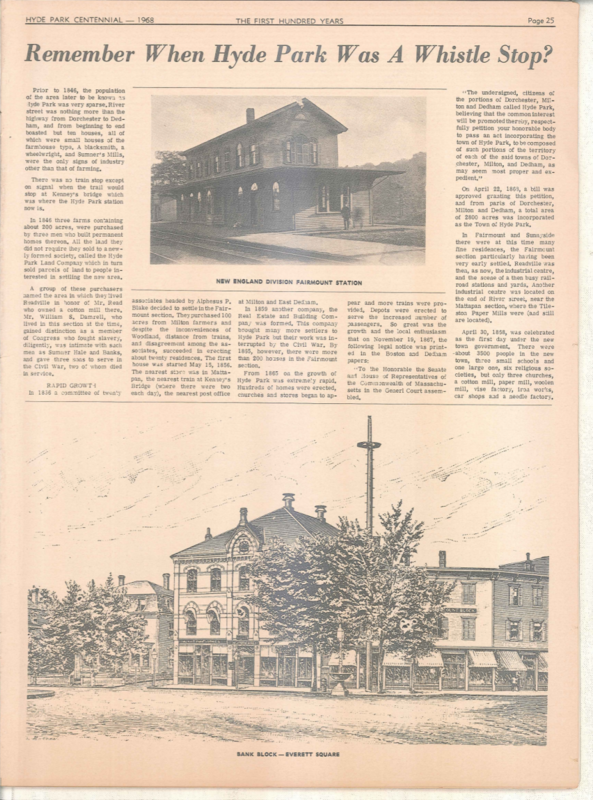 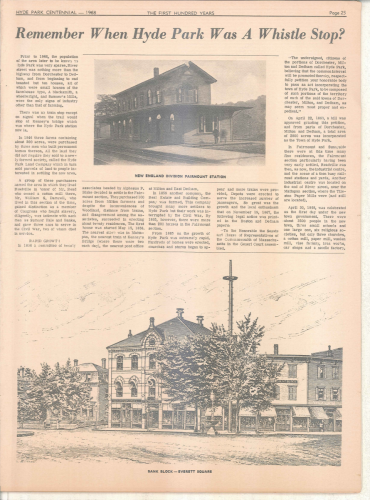 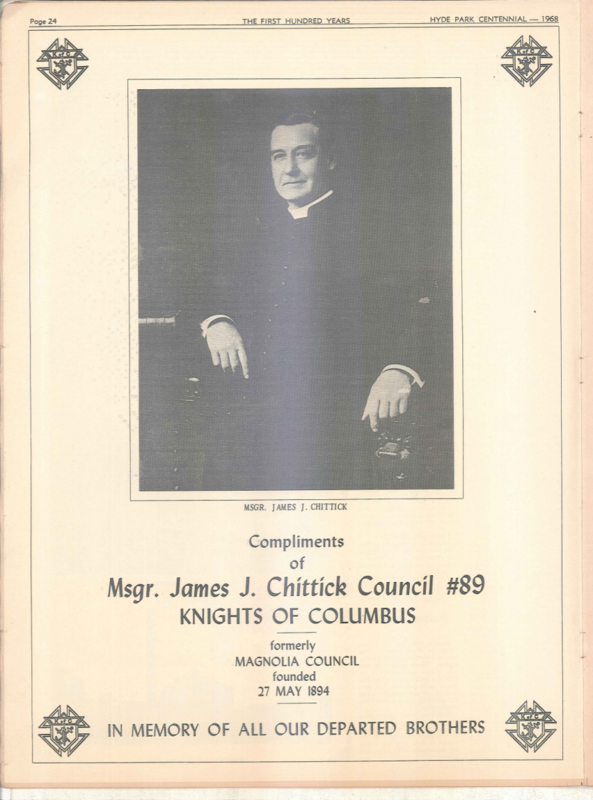 The Hyde Park Centennial Committee is proud to present to you this 72-page chronicle of Hyde Park history – past and contemporary – as its contribution to the town’s 100th anniversary. This edition is designed to provide a broadened knowledge of Hyde Park’s historic past, its eminent present and recount some of the milestones which shape the high arch of its future. 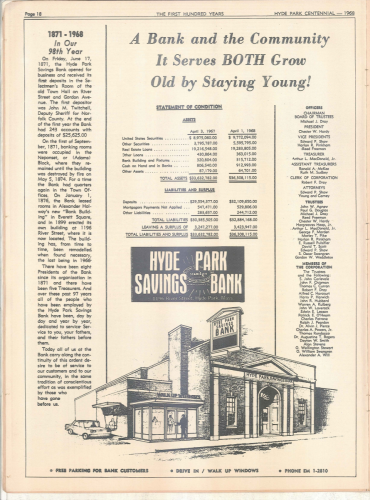 It is a fitting tribute to Hyde Park’s century heritage, the sweep and scope of its accomplishments to acknowledge the inability of a single volume of news columns to achieve more. 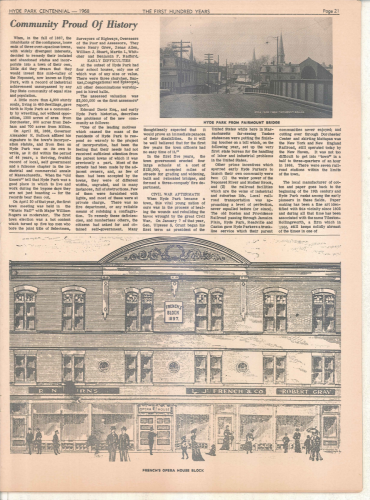 In its evolution from worlds old to new, Hyde Park stands high in the honor roll of pioneer souls who knew today’s gracious residential community only as a bustling center of trade, commerce and industry. 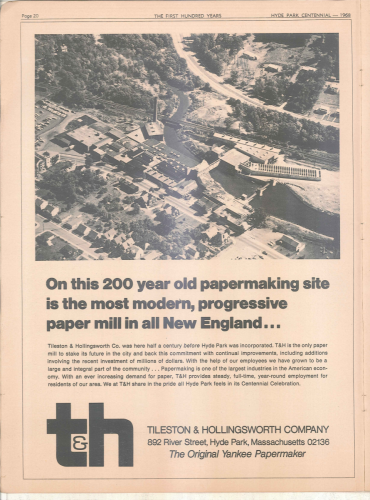 From this crucible was forged firsts which included patents for the typewriter, silencer, fire alarm, water meter and the “flying machine”. Boldness and vigor, enterprise and imagination were true hallmarks of Hyde Park’s early settlers. 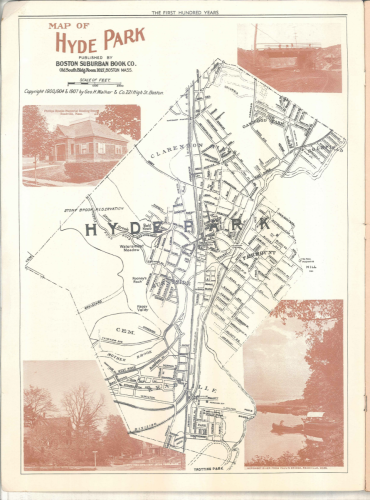 Indeed, these hardy traits were embodied by Hyde Park’s first settlers – the “Twenty Associates’ who came first to Hyde Park in 1856 and built the first houses on Fairmount Hill. 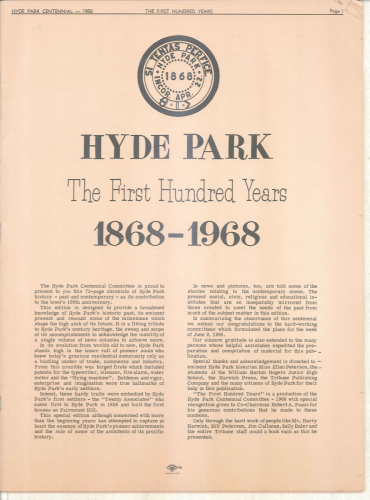 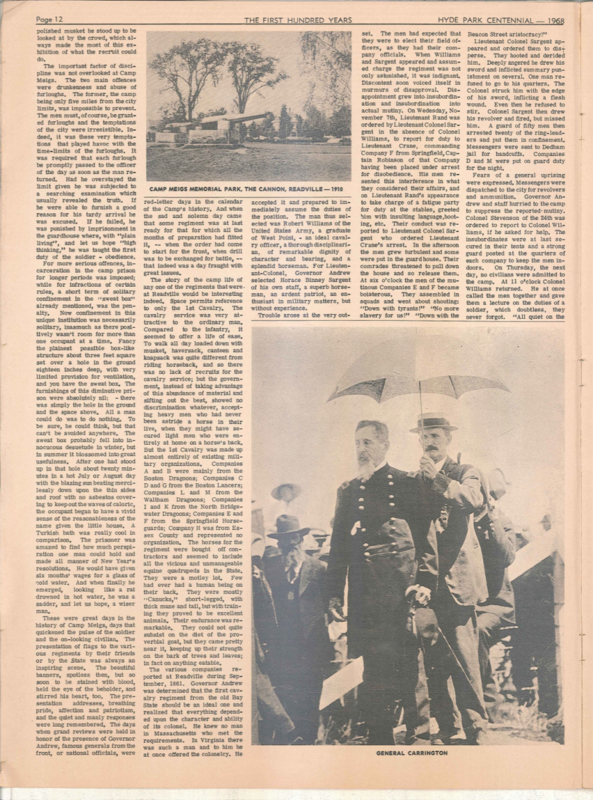 This special edition although concerned with more than the beginning years has attempted to capture at least the essence of Hyde Park’s pioneer achievements and the role of some of the architects of its prolific history. 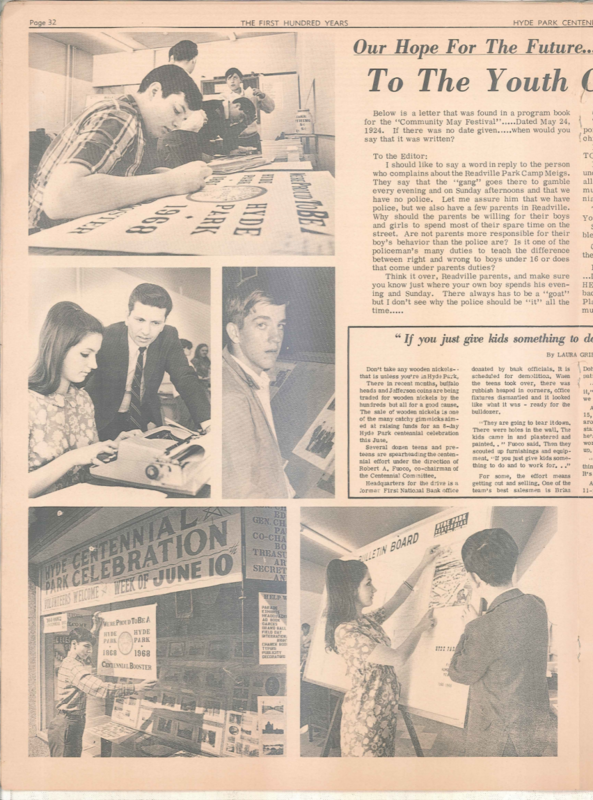 In news and pictures, too, are told some of the stories relating to the contemporary scene. The present social, civic, religious and educational institutes that are so inseparably mirrored from those created to meet the needs of the past from much of the subject matter in this edition. 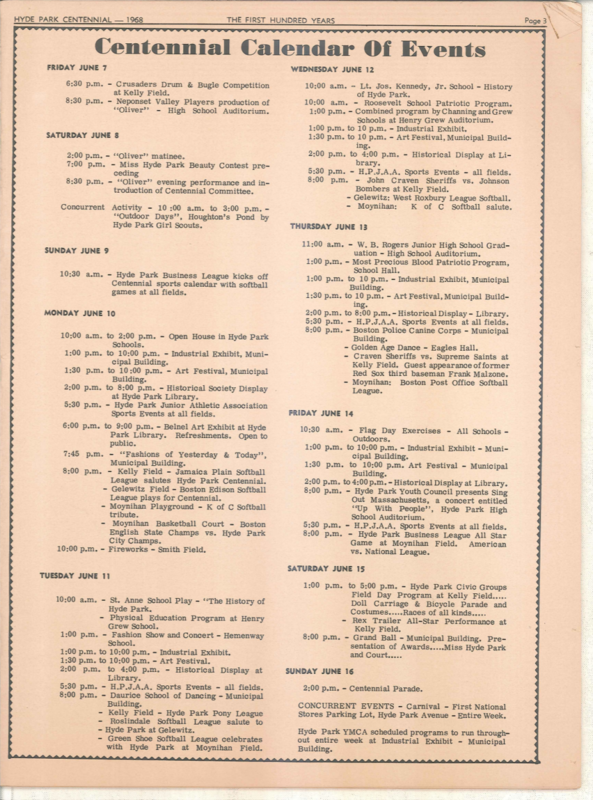 In summarizing the observance of this centennial we extend our congratulations to the hard-working committees which formulated the plans for the week of June 9, 1968. Our sincere gratitude is also extended to the many persons whose helpful assistance expedited the preparation and compilation of material for this publication. 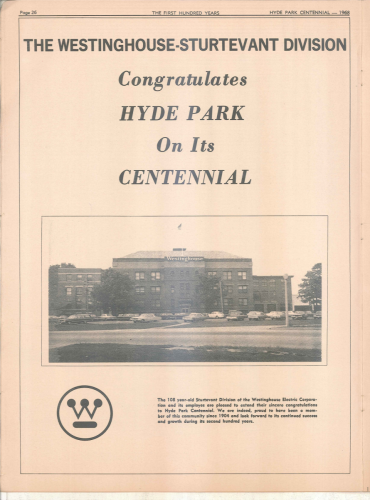 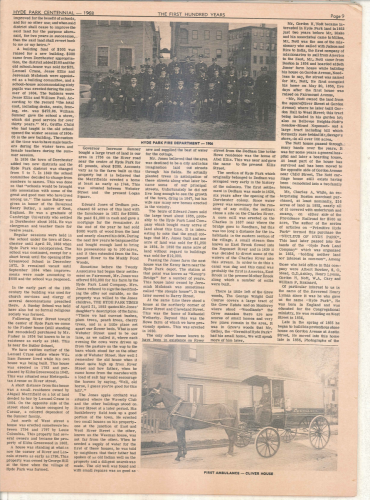 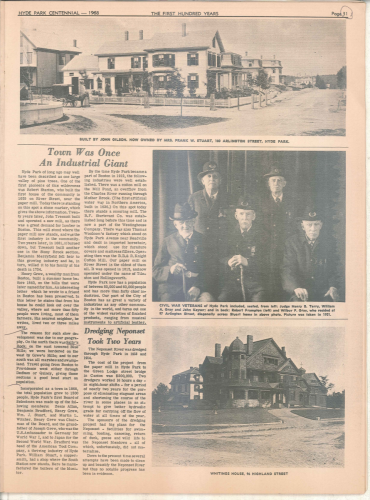 Special thanks and acknowledgement is directed to – eminent Hyde Park historian Miss Ellen Peterson, the students at the William Barton Rogers Junior High School, the Harwich Press, the Tribune Publishing Company and the many citizens of Hyde Park for their help in this publication. 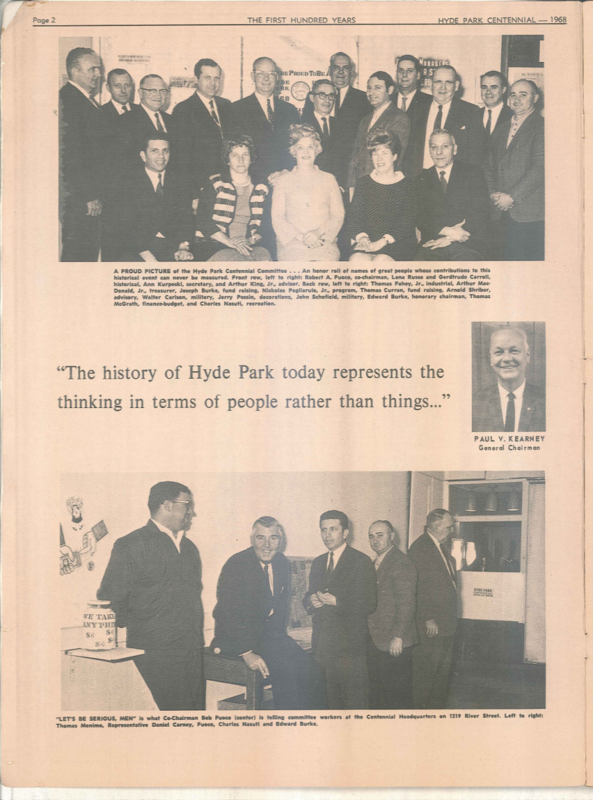 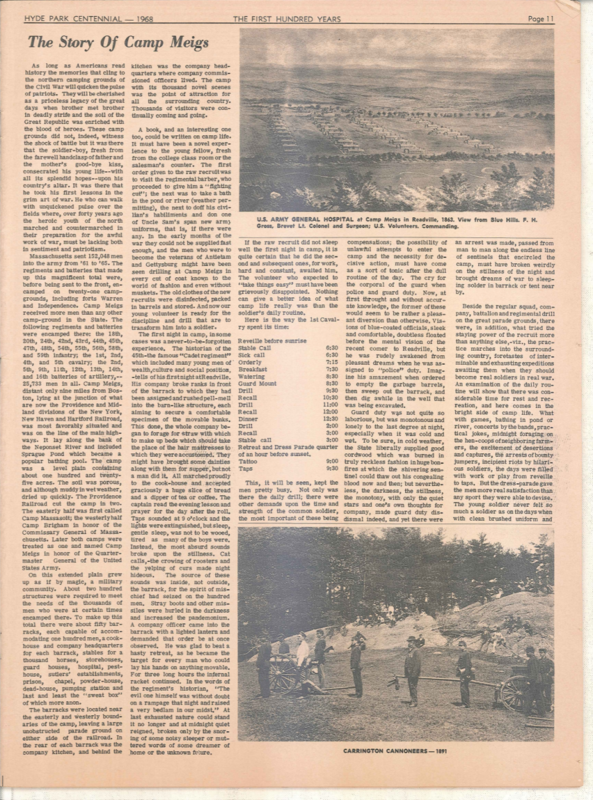 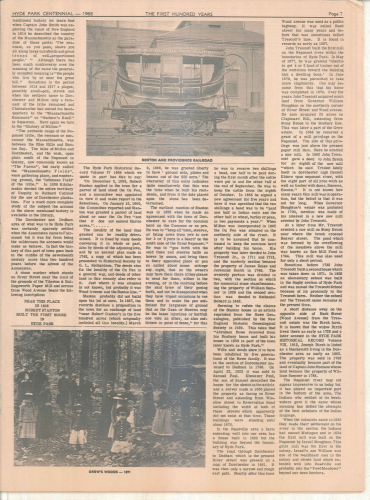 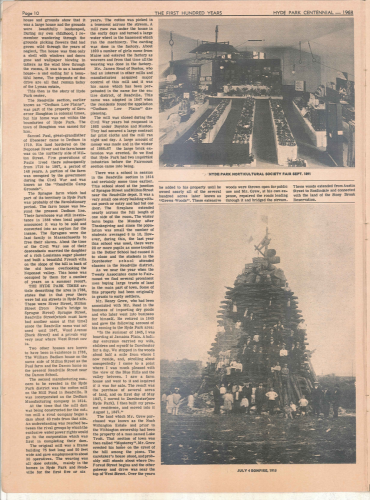 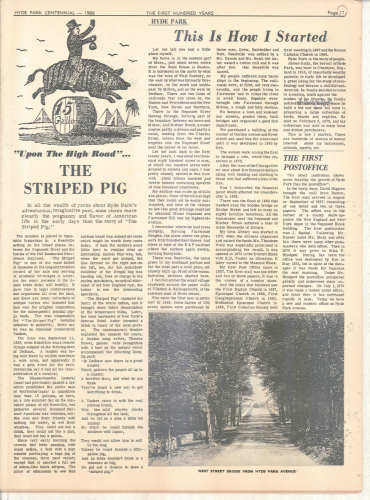 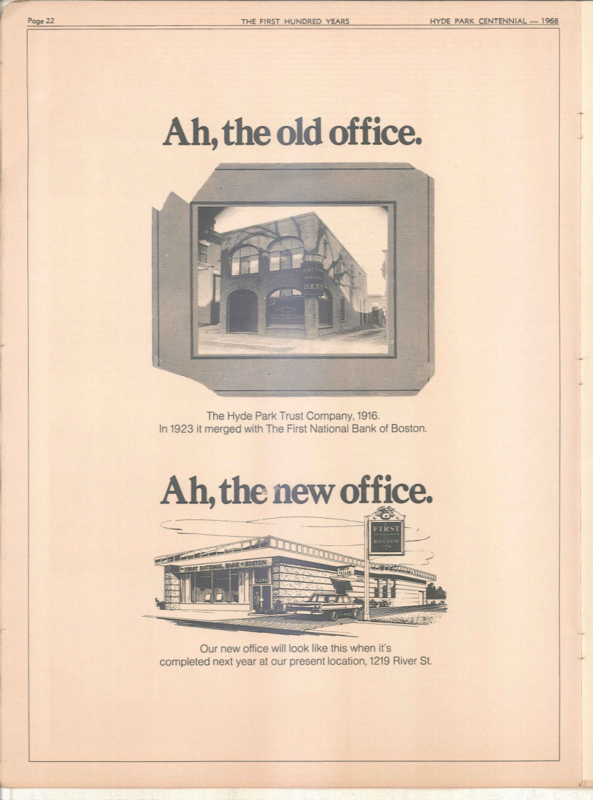 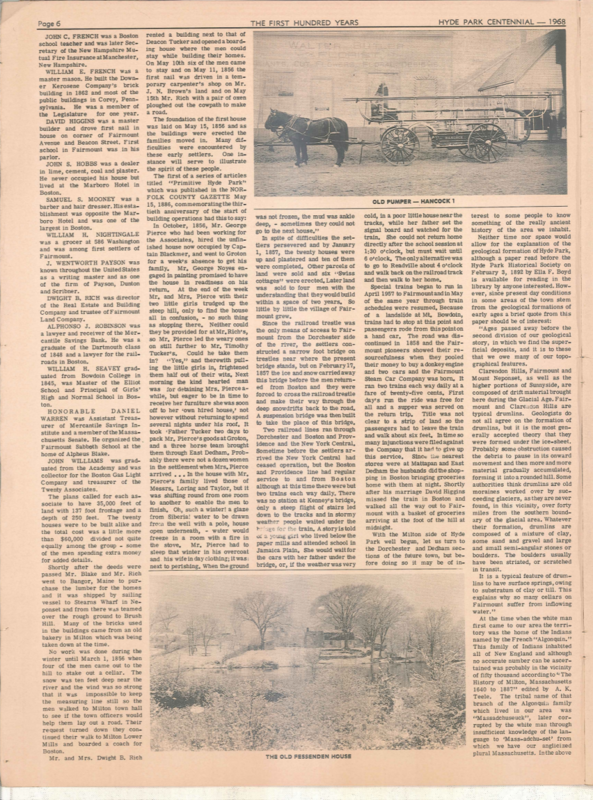 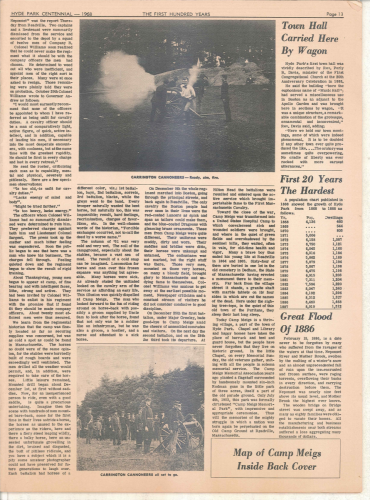 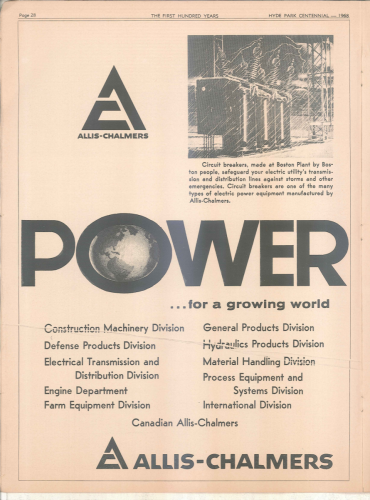 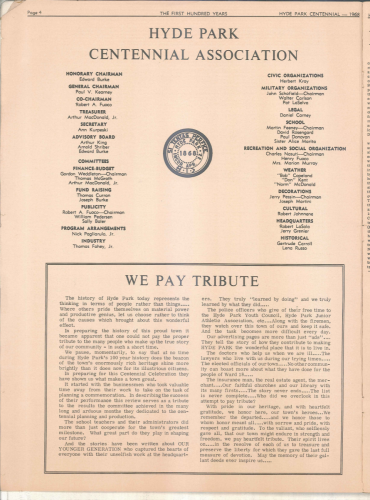 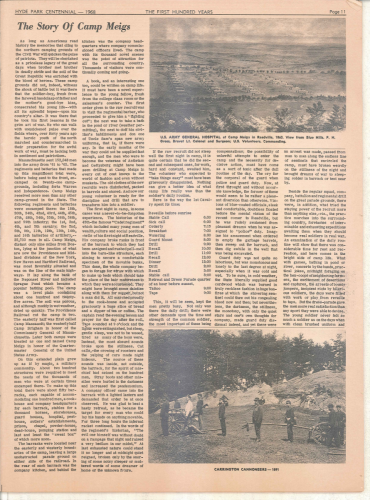 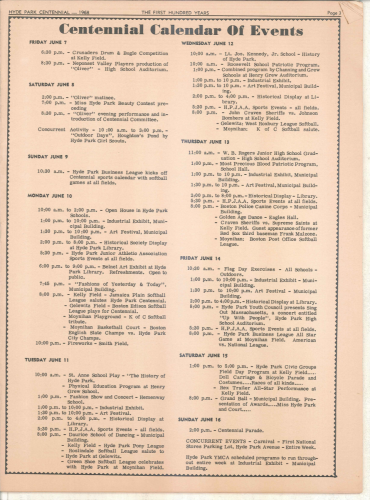 “The First Hundred Years” is a production of the Hyde Park Centennial Committee – 1968 with special recognition given to Co-Chairman Robert A. Fuoco for his generous contributions that he made to these contents.